I tell you, this is better than Orkut anyday. The Glass Plate Game. A game of collaborative thinking. Looks very, very interesting. M: John Sack on one company in Vietnam. This week I had to take a trip to Ikea Croydon (like Croydon, only Swedish)to buy a sofa. Pretty mundane, really. But on the way I got to use the Tramlink service, that runs from Wimbledon to Croydon, and stumbled across a rather interesting piece of UI design. 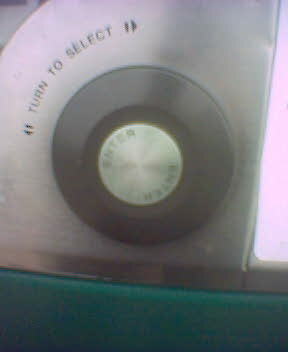 Ticket machines in London are funny beasts; the simplest (Tube quick ticket machines/bus ticket machines) require a single button press to choose a ticket. There used to be those huge matrix-of-buttons Tube ones, but they’ve now been replaced with touch screens. Touch screens are all over the place on the railways. And the railway quick ticket machines require far too many different coloured buttons to qualify as “entirely easy to use” (at first glance, anyhow). Tramlink ticket machines are great. They’re quite chunky, and need to be weatherproof. The screen is encased in metal, and initially I thought it was a touchpad. Oh no. Really, it’s a giant, weatherproof, iPod. Bottom left of screen is a metallic cancel button. Bottom right is a large (2.5″ diameter) rubber wheel, with a metal button in the middle of it. You turn the wheel to select things on screen, hit the center button to select. It’s weatherproof, it’s durable, it’s easy to maintain, and doesn’t lead to the whole “hitting the wrong thing” problem that touchscreens have. Sure, it’s entirely cobbled from an iPod, but it’s interesting to see that piece of consumer design reinterpreted on a more industrial level. That’s the wheel in the bottom right. Hey there hipsters! Unemployed? Not sure where to put that messy hairdo and scrawny frame? Go get thee a job at the Regent Street Apple Store, so you can fix my PB when it breaks. And maybe give me a free iPod. danny said i look like the should-be next doctor who. Matt Webb’s friend Danny is right. (Matt is on a roll at the moment; his stuff on dogs is fascinating, but I’m not sure I’m fully there with the Dictionary, Intertextual, yet. Things might be even quieter than usual around here for a while. Moving. Will let you know how it goes. New Photovore: Reflected Trees. Escher-like, simple, monochrome. The demise of Hypercard from Apple’s support pages has not gone unnoticed, it seems; it made Slashdot, and Dan Hill reminisced about his experiences with it during his degree. I too have fond memories of Hypercard. My school, unusually, had a computer room full of Macs (the first five Mac Pluses being supplanted with Classics, the odd LC, and by the time I left the senior school, iMacs left right and centre. We still ran the junior school server from a Mac Plus with 40mb hard disk in 1995…). As such, Hypercard came on everything. Some of the smart older kids started investigating it. Many had been exposed to Hypercard without knowing it; the popular edutainment game Manhole was basically a Hypercard stack. And so, for the geeks who spent their lunch break in the IT room, Hypercard proved to be a most interesting diversion. The really interesting bit was the scripting – the way that it was quite easy to turn a flick book of cards into a real program, using a scripting language very similar to real English. This was pretty easy for eleven and twelve year olds to get the hang of. One guy produced a really superb – I mean it – point and click adventure; it had stylish graphics, subtle use of scripting for puzzles and some stylish scripted animation. I was never that inventive, and to be honest, I was about ten when I was really fiddling with it, but I still came up with some interesting things. I produced a rudimentary notepad/database. Rudimentary is the operative word: it consisted of a scrolling text field. I think you could create new pages with text fields in and flick between them; you could definitely print by clicking on a button that ran a little bit of Applescript. Basic; almost useless. Still, I was only ten and it was very satisfying to produce something that had the impression of usefulness. It combined a lot of things, too – a little bit of UI design, a little bit of scripting. I was far more successful in Hypercard than I’d ever been in QBasic. My last project, I believe, was an elaboration of the basic textfield notepad; it was to be a PDA called PDQ, with notepad, database, perhaps even a calculator. Basic, maybe, but I was dreaming. Hypercard made it easy for people to realise dreams; you didn’t even have to be able to script to come up with some moderately functional stacks. The fact it was free with every Mac was a wonderful bonus. I only ever used it at school, and dearly hoped for a PC equivalent. I believe there might have been one, but it didn’t have the same feel as squinting at the little Classic screen and trying to get flickbook animation to work. Much to my own disappointment, I was never much of a programmer. I tried so hard; I can do algebraic stuff, use programs as little scripting languages to calculate things, and can even pseudocode simple algorithms, but I don’t think like a programmer. I haven’t tried in a while, to be honest; markup’s more my kind of scene, anyhow. Every time I settled down with my book on learning C, I got so far and then hit a brick wall. Perhaps I was too young, but even BASIC floored me some days. I may never program – not properly, anyhow – but Hypercard gave me and many others the chance to write useful stacks and programs with disconcerting ease, and gave us, for a few scant minutes and hours, the sensation of really being a programmer – of creating something digitally. I now get that joy from the web, and am getting back into programming through my love of markup. I wouldn’t be surprised if trying to align buttons neatly in Hypercard has anything to do with this.